Cuts, Scrapes and Bruises. These are the most common injuries. Jammed Toe. The end of a straightened toe receives a blow. This is usually from stubbing the toe on an object. The energy is absorbed by the joint surface and the injury occurs there. This is called traumatic arthritis. Crushed or Smashed Toe. This is usually from something heavy falling on the toe. Sometimes, the nail can be damaged. Fractures are unusual, but are at risk for a bone infection (osteomyelitis). Toenail Injury. 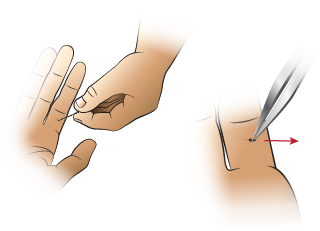 If the nailbed is cut, it may need sutures to prevent a permanently deformed nail. This is less important for toenails. Subungual Hematoma (Blood Clot under the Nail). Most often caused by a crush injury. It can be from a heavy object falling on the nailbed. Many are only mildly painful. Some are severely painful and throbbing. These need the pressure under the nail released. A doctor can put a small hole through the nail to release the blood. This can relieve the pain and prevent loss of the nail. Dislocations. The toe has been pushed out of its joint. Fractures. Toe has a broken bone. The treatment is the same whether the toe is broken or just bruised. Broken toes are not put in a cast. Most swollen, bruised and painful toes are not broken. X-rays are only needed for severe pain and severe injuries. If the big toe might be broken, it should be seen by a doctor. The other injured toes generally don't need to be seen. A broken great toe is not urgent. It can be checked during office hours. The treatment is the same whether or not the toe is broken. The treatment of all broken toes is pain medicine and comfortable footwear. There are many ways that children can hurt their toes. There are also many types of toe injuries. You can treat minor toe injuries at home. Caution: Be certain range of motion is normal. Your child should be able to bend and straighten each toe. If movement is limited, your doctor must check for a broken bone. Soak the foot in cold water for 20 minutes. If the pain is more than mild, "buddy-tape" it to the next toe. Wash the toe with soap and water for 5 minutes. 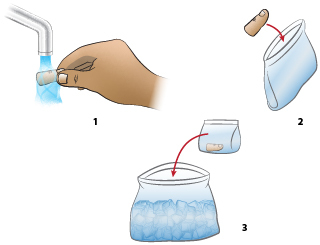 Soak the toe for 20 minutes in cold water for pain relief. If regular shoes cause too much pain, make a change in footwear. Wear a shoe with a firm sole to limit motion. Reason: Injured toes hurt when they bend (are flexed). If the top of the shoe increases pain, wear an open-toe sandal. Another option is to use an old sneaker. Then cut out the part over the toe. Buddy-taping is taping the injured toe to the one next to it. 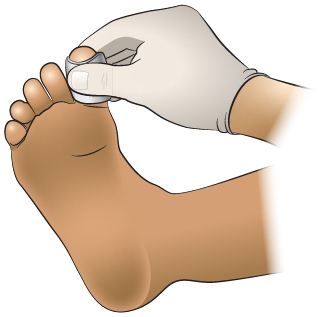 Method: Gauze padding must be placed between the toes before taping them together. How long to buddy tape: Usually needed for 1 - 2 weeks. By then new bone formation will close the break. Then pain with movement will be reduced. Usefulness: Buddy-taping is optional. Sometimes, it makes the pain worse. Wearing the right shoe is much more helpful.